Of Note: The Pittsfield Cultural Council is seeking new members. Would you like to have a say in how the local arts community is funded? Are you interested in learning about cultural programming in the city? Theye’re a volunteer group that allocates grants to Pittsfield-based arts and cultural organizations on an annual basis. For more information, contact them. Photography The Cultural Center of Cape Cod invites photographers to submit images to their online competition, FAUNA. Wildlife photography aims to capture a one-of-a-kind look at the wonders of the animal kingdom. Embrace the wilderness with animal as the subject in their most powerful, raw, vulnerable, and natural form. All methods of capture and process are welcome. All winners will be displayed in their online gallery at www.cultural-center.org First Place $500, Second Place $200 and Third Place $100. The Cultural Center directors will jury. Learn more. Public Art The Codman Square Neighborhood Council (CSNC) is spearheading the redesign of the Codman Square Park with the Friends of Codman Square Park. Creative placemaking is envisioned by creating a new plan for its landscape design which will be integrated with public art. An artist/designer will be selected to design integral public art for the park in collaboration with the landscape architect chosen for the redesign of the entire greenspace. At this stage, the vision for the public art portion of the project is broad and may encompass one focal public art element or a series of components. Learn more. Poets The Grayson Books Poetry Prize, open to all poets writing in English, is accepting submissions of poetry manuscripts, 50–80 pages, including title page and contents. Patrick Donnelly is the judge. The winner will be awarded $1,000, as well as publication, and 10 copies. Simultaneous submissions acceptable. Learn more. Filmmakers Socially Relevant Film Festival New York Submissions are now open. SRFF is a non-profit film festival designed to shine a spotlight on international and local filmmakers who raise awareness of social issues, in response to the proliferation of violence and violent forms of storytelling on screen. SR (TM) believes that through raised awareness, expanded knowledge about diverse cultures, and the human condition as a whole, it is possible to create a better world free of violence, hate, and crime. Learn more. Public Art The George B. Henderson Foundation is dedicated solely to the enhancement of the physical appearance of the City of Boston. To that end, grants of up to $40,000 will be awarded in support of projects that improve the visual environment of city parks, streets, buildings, monuments, and architectural and sculptural works. Each project must be visible to the public, preferably from a public way. Preference will be given to capital projects such as the restoration of historic buildings; the creation of new public sculpture and gardens; the restoration of historic monuments; and other projects that enhance the quality of life and a sense of place in the city while demonstrating design excellence. Projects in neighborhoods that have not been well represented in previous grants, including but not limited to East Boston, South Boston, Mission Hill, Allston/Brighton, Charlestown, Chinatown, Mattapan, and Roslindale are encouraged. To be eligible, applicants, unless a municipal agency, must be an exempt organization under Section 501(c)(3) of the Internal Revenue Code and must submit a copy of a determination letter from the IRS. Projects must be sited within the City of Boston. Learn more. Image credit: Black and white photograph of an older woman walking past a performance hall. 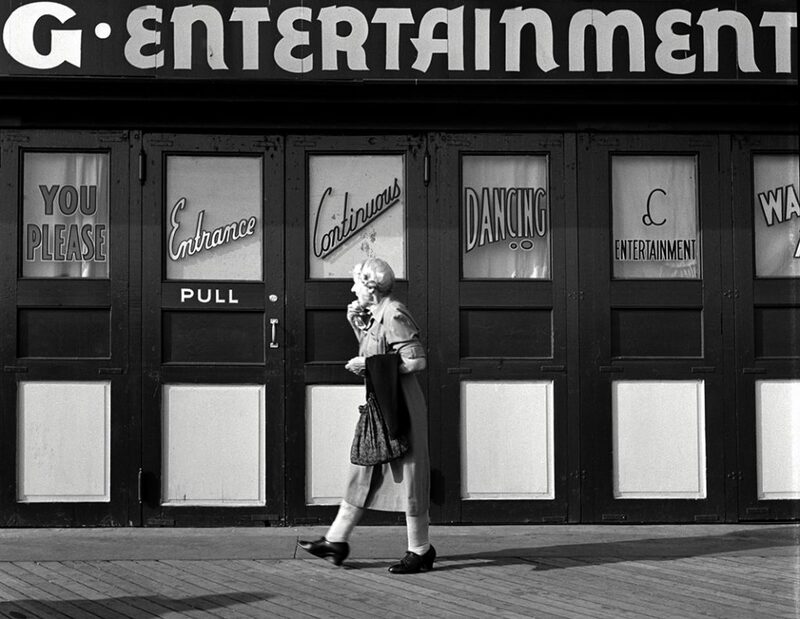 Entertainment, 1950, by Martin Elkort.